"When in doubt, do nothing"
ago. Although they are both growing the green one has almost completely lost its' color and the red one is paler but holding on. Here is some background on their circumstances. They are in a 55 gallon with a 30 gal refugium that has been running for 6 years. Lighting is a 4 bulb T5 with 2 AquaSun bulbs, 1 IndigoSun bulb and 1 actinic (system 4 months old). Daytime bulbs run for 10 hours a day. Water parameters: Ammonia, Nitrite, Nitrate all 0. Phosphate tests out at 0. Calcium 400-450, alkalinity 3.5 meq, pH 8-8.2. I run Chemipure and activated carbon and do weekly 10 gallon water changes with RO/DI water mixed with Tropic Marin Reef (marinated for days). When I first got both of them I started them at the bottom of the tank and moved them (after a month) half way up the tank. What could be the problem? Water quality, lighting (too much? not enough?) Any direction you can point me in would be very appreciated. HELP!! !, Why would only branching monti's retract polyps?? Has anybody else experienced this strange behaviour?? Last week all of my branching Monti's retracted all of their polyps (which had been fully extended for many months prior to this) and look like bald pieces of rock. This happened to 3 different digitata's (peach and purple ones), a ORA Jeremy's Monti, ORA spongodes. this is really weird and disturbing because ALL other corals (SPS, LPS, Zoas, etc. Are not exhibiting this trait whatsoever. I have a sunset Monti and a Rainbow Monti that are still OK, as well as plating Monti's that are ok as well, and all other SPS' have extended polyps including Birds Nests (thick branched and thin), millies, red planet, several chalices, basically all other living inhabitants are OK! System param.s: I have a 125 mixed reef tank with 40 gal sump, protein skimmer, running BRS GFO in a reactor, carbon in a reactor, daily 2 part dosing (Randy Holmes Farley recipe), plenty of flow/water turn over using RKE wave maker setting with 2 Koralia Magnum 7s and 2 4s, plus dual returns from sump. NO3: 4 - red sea Pro low level Nitrate test kit, confirmed at SEA with High end Hanna tester. Tank has been set up for 1 1/2 years. Nothing (to my knowledge) has changed in my tank that I can point to that would cause just branching Monti SPS to totally retract their polyps, while everything else is fine, especially since Monti's are supposed to be hardier than most SPS' are. If anyone has experienced this before and/or can shed some light on this, I would welcome the input. Thanks Bob, I was reading on your site that removing too much phosphate can also cause these symptoms of starving the corals, true? I tested my PO4 yesterday with my Hanna checker and it was zero, so I took my gfo reactor and carbon reactor off line to see if letting the PO4 build up some to around 0.04 on my checker would help? The reason I am leaning that was is based on what my last PO4 reading was before the symptom started showing up (my recorded PO4 level was about 0.05). Could the water be too "clean" for the branching Montis? Based on the limited information you have about my system, would you still lean toward the Zoanthids? 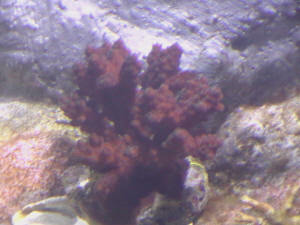 The branching type Monti's that are affected are in different areas of the tank and have been in the same spot for several months before this occurred. One final thought (change that I made just before this happened) I had several smaller power heads for flow in my tank, that were not on any sort of timers or wave makers, so I replaced them and reconfigured my flow with the two Koralia magnum 7s on an RKE wave maker. This has provided a LOT more varied flow for my tank and just after making that change I noticed the branching Monti's retracting all of their polyps. Just want to mention that none of the Montis are directly in front of the power heads and are not getting blasted with flow. Could it be the increased flow is "stirring up" the Zoas released chemicals causing this? Based on this limited info about my situation, what would you do in this situation? I purchased this blue Montipora capricornis some time ago. It's growing very different from my other Monti caps, it has mini pillars forming, so I'm wondering if it might be another type of Montipora. It's not very blue, I know, but I just upgraded from 8x24W T5 to 250W MH with 4x24W T5HO so its color is changing. However I'm not sure it will ever become the bright blue I originally saw pictured. You can barely see them in the picture, but the tiny polyps are bright blue, and not as close together as my other caps. Then I changed to HQIs and the same, I thought they were getting bleached but considering that it also happened with T5s in mid of the tank then IÂ´m not sure its the light. 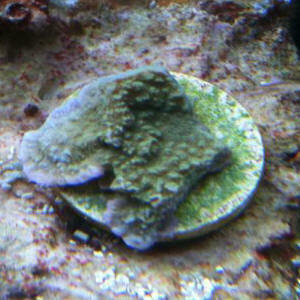 I also have all kinds of encrusting montis and they are unaffected, I also have an orange Monti cap and it remains unaffected as well, I have green and yellow Acros and they keep their colors, green Monti caps are the only ones that turn cream colored, I donÂ´t know why. I just want to inform you of a very noticeable change. Two nights ago I fed the tank 1 vial of Prodibio reef booster. Turned the skimmer off. The next day I observed the green montis that are now cream montis to be sort of "tanned" as if they got a bit of colour from last nightÂ´s feeding. 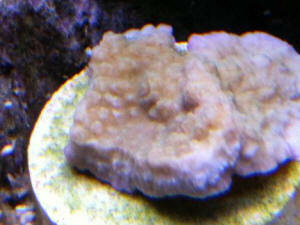 Eleven days ago I purchased my first Montipora capricornis frag. Except for two small pale spots the frag appeared in good condition. After the first week the two pale spots nearly disappeared. However, about three days ago I noticed the white margin beginning to widen. When I purchased the frag it had a small white margin (less than 1 mm wide) but now it is 2-3 mm wide. 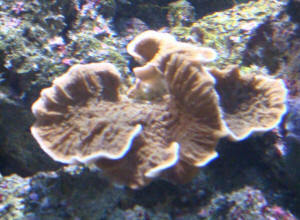 I have attached a photograph of the frag (sorry for the poor photo). 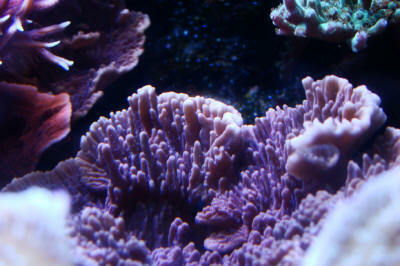 I acclimated the frag as I typically do with other corals and placed it mid-level in my 24" tall tank. I have a PC lighting system (1-65W Actinic, 1-65W 10,000K and 1-65W 6,700K) that mimics the diurnal cycle. 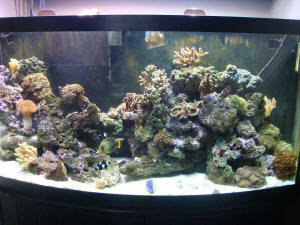 The lights used by the LFS were metal halides and the holding tank was about 8" deep. My water quality parameters are OK. I also purchased a frag of Acropora spp. 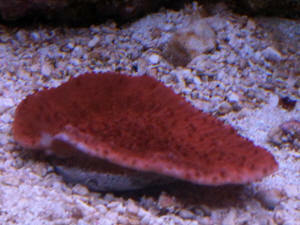 at the same time as the M. capricornis frag, acclimated it using the same technique and placed it at the same depth. The Acropora spp. frag is doing very well. I have seen pictures of wild M. capricornis with similar white margins and have read that white margins could be a sign of growth. I have also read that the coral may be losing its zooxanthellae. Should I be concerned of the widening margin? Is there anything I should try? Any suggestions will be warmly received. Acropora questions. 6/5/08 Hello! 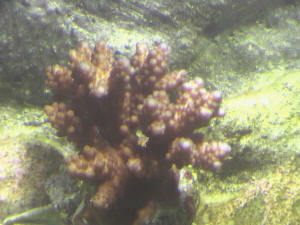 <Greetings!> I think I have an Acropora Digitata. 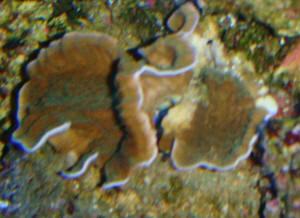 <Looks like a Montipora digitata to me...> Bought the little guy from LiveAquaria.com about 2 months ago. He used to be in a smaller tank, didn't grow much, and stayed brown. I have recently put him in my bigger tank with the same amount of light, and more flow, and he is turning into the purple color you can see in the picture. <Does happen. Always exciting.> I noticed in the FAQs that it is simply just utilizing the light in a different way, hence the color change. Correct? <In essence. Better/more light makes a need for UV-blocking pigments, and better water flow/ quality allows for coloring pigments to be produced.> Also! The tips on the ends of the "branches," seem to be a creamy, off white. Is that a sign of growth, or is it stunted from being put into a new tank? It has been in the tank a little over 3 weeks.. <Just the growing tips, as far as I can tell. If you don't see shrinking tissue and there is continued growth, all is well.> Thanks! <No troubles. Benjamin> Acropora questions. Sys. 6/5/08 Hello! 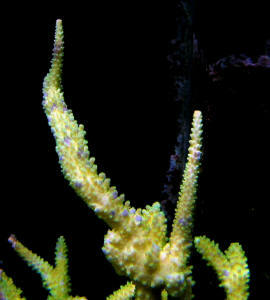 <Nicolas> I think I have an Acropora digitata. Bought the little guy from LiveAquaria.com about 2 months ago. He used to be in a smaller tank, didn't grow much, and stayed brown. I have recently put him in my bigger tank with the same amount of light, and more flow, and he is turning into the purple color you can see in the picture. I noticed in the FAQs that it is simply just utilizing the light in a different way, hence the color change. Correct? <Possibly. Could be other influences, differences in the two settings as well> Also! The tips on the ends of the "branches," seem to be a creamy, off white. Is that a sign of growth, or is it stunted from being put into a new tank? <Let's hope the former. 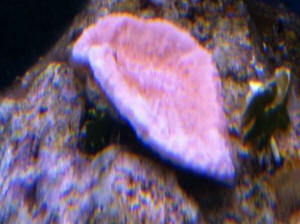 Often the growing ends/tips of Acroporas are light/er colored> It has been in the tank a little over 3 weeks.. Thanks!